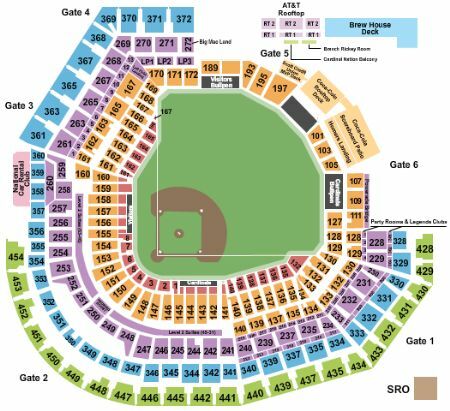 St. Louis Cardinals vs. Pittsburgh Pirates Tickets - 7/17/2019 - Busch Stadium in St. Louis at Stub.com! Mobile Entry Tickets. Must have smart device on hand to enter event. Do not print these tickets. Tickets will be ready for delivery by Jul 16, 2019. Mobile Entry Tickets. Must have smart device on hand to enter event. Do not print these tickets. Tickets will be ready for delivery by Jul 17, 2019. Does not include admission to event. Tickets will be ready for delivery by Jul 13, 2019. Club Section. These are Club Section seats. Mobile Entry Tickets. Must have smart device on hand to enter event. Do not print these tickets. Tickets will be ready for delivery by Jul 13, 2019. Mobile Entry Tickets. Must have smart device on hand to enter event. Do not print these tickets. Tickets will be ready for delivery by Jul 15, 2019. Fourth row in this section. Tickets will be ready for delivery by Jul 15, 2019. Third row in this section. Tickets will be ready for delivery by Jul 15, 2019. Second row in this section. Tickets will be ready for delivery by Jul 15, 2019. These seats are on the aisle with purchase of the entire group. Tickets will be ready for delivery by Jul 15, 2019. Does not include admission to event. Tickets will be ready for delivery by Jul 16, 2019. Mobile Entry Tickets. Must have smart device on hand to enter event. Do not print these tickets. Tickets will be ready for delivery by Jul 14, 2019. Fifth row in this section. Tickets will be ready for delivery by Jul 15, 2019. First row in this section. Tickets will be ready for delivery by Jul 15, 2019. Second row in this section. Tickets will be ready for delivery by Jul 10, 2019. Mobile Entry Tickets. Must have smart device on hand to enter event. Do not print these tickets. Diamond Box seats. Tickets will be ready for delivery by Jul 15, 2019. Mobile Entry Tickets. Must have smart device on hand to enter event. Do not print these tickets. Includes access to the Cardinals Club which is located directly behind homeplate. Access to an exclusive club which includes an upscale pregame buffet, full-service bar, private restrooms and in-seat food and beverage service during the game. All food and drinkes are included with the ticket. Tickets will be ready for delivery by Jul 13, 2019.